Pagosa Springs, Colo.—Every 18.6 years the moon stands still at Chimney Rock. On July 22, in the wee hours of the morning, the crescent moon will rise between the spires of companion rock and chimney rock, loiter for a five to fifteen minutes, then disappear behind Chimney Rock, leaving a lingering moon glow. The cycle is complex. For the first half of this year, the moon rose during the day, in phases from near full down to thin crescent, rising earlier each month from early afternoon to early morning. In July the moon will rise between the rocks as a nearly invisible new moon, in the early hours of morning before dawn. From August through November, the waxing moon will rise between the rocks from crescent to nearly full, rising earlier each month during the nighttime from just before dawn to just before sunset. Finally the full moon will rise between the rocks at sunset near the Winter Solstice in December. The Major Lunar Standstill is believed to have influenced construction of the most impressive of the 200 plus structures at Chimney Rock—the Great House Pueblo. 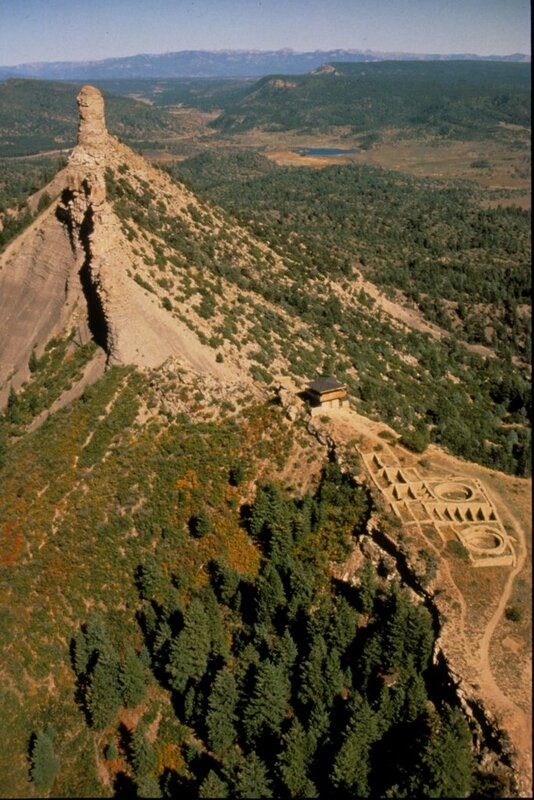 People of the Chaco (Ancient Puebloan) culture who occupied Chimney Rock between AD1050 and 1125 built the Great House. Additionally, at the time of the Summer solstice, the Sun rises centered on the northern wall of the Great House and the southern point of the Great House lines up to a spot in the sky where the Crab Nebula Supernova appeared for over three weeks in AD 1054. Dr. McKim Malville, who demonstrated the lunar standstill alignment in 1988, proposes that Chimney Rock’s people were more than just aware of these events. Malville suggests that they celebrated them, in part by constructing the Great House Pueblo to mark and revere the beautiful and rare lunar events captured–or protected–by Chimney Rock’s twin monoliths. Prior to the rising, a 30-minute public program kicks off at the visitors cabin. Visitors then drive their own cars three miles up a steep and curvy graveled road to the upper parking lot. The group then ascends the narrow trail past the Great House site to the Fire Tower observation deck. The program is appropriate for those 12 and over. Every visitor is required to bring a working flashlight and be prepared to hike a narrow trail at 7,600 feet and stand for the duration of the program. At the end of the program, everyone will hike back down and are invited back to the Visitors Cabin for hot drinks and an optional presentation on the Chimney Rock Lunar Standstill. From arrival at the Visitor’s Cabin to departure from the Archaeological area, total time for the program is approximately 3 hours. Later in the day on Saturday, July 22 and also on Sunday, July 23, Native Americans gather at Chimney Rock for cultural dances in the Great Kiva with traditional singers and dancers from the pueblos of Hopi, Acoma, Laguna, Zuni, San Juan and San Felipe, as well as Aztec and Jicarilla Apache Dancers. The Traditional Pueblo Dances are at 11 a.m. and 4 p.m. No reservation is necessary for these days and admission is only $10. For more information contact Caroline Brown at Friends of Native Cultures (970) 731-4248. Tickets for the Lunar Standstill Programs are $50 per person and must be prepaid with Visa or Mastercard. Only 24 tickets are available per Lunar Standstill Program and the events sell out quickly. Tickets are still available for the Major Lunar Standstill events in September and October. Fees generated from Lunar Standstill Programs support native Puebloan involvement at Chimney Rock. For reservations and program details, please call Victoria White at (970) 264-9987. Major Lunar Standstill events differ from the monthly full-moon program at Chimney Rock. During monthly full-moon programs, visitors can watch the moon rise at the Great House Pueblo site. However, during these programs the moon will not rise between the spires. The program includes information about the Ancestral Puebloans, archaeo-astronomy theories, area geology and Native American flute melodies by Charles Martinez, a native Pagosan of Jicarilla Apache and Navajo heritage. On July 10, the gates open from 7:15-7:45 p.m. and the program begins at 8:15 p.m. with moonrise at approximately 8:47 p.m. On August 9, the gates open from 7:15-7:45 p.m. and the program begins at 8:15 p.m. with moonrise at approximately 8:41 p.m. On September 8, the gates open from 6:30-7:00 p.m. and the program begins at 7:30 p.m. with moonrise at approximately 8:05 p.m.
Reservations are required for the full moon programs and tickets are $15. Add $5 for an early tour of the lower area (Great Kiva Trail Loop), which starts at 6:15 p.m. (5:30 p.m. in September). For tickets call the visitor cabin at (970) 883-5359 from 9 a.m.-4:30 p.m. daily. The visitors cabin at the Chimney Rock Archaeological Area is located ½ mile off Highway 151, 3 miles south of Highway 160, between Pagosa Springs, Colo. and Durango, Colo.